From fine leather goods and luxury accessories to functional garments, these are all included in the range of high-quality products in the 2015 AMG Selection. Other new products included in this year are matching accessories for the new sports car Mercedes-AMG GT. The AMG Selection 2015 is now available at Mercedes-Benz partners. Naturally a focus of the 2015 AMG Selection centres on the exciting new sporty Mercedes-AMG GT. 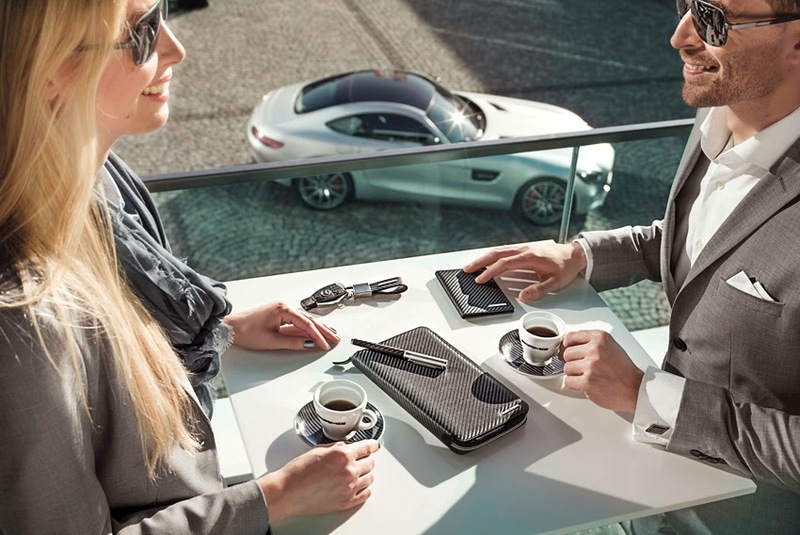 Owners and fans of this unique sports car are the target audience of this new collection, for example the AMG GT Capor the exclusive iPhone6 Case. The anthracite coloured cap has an embroidered AMG logo on the front and an embroidered GT logo on the back. The AMG GT iPhone Case is made of carbon/polycarbonate in black/anthracite in solar beam yellow with contrasts. The case is designed foriPhone6. The AMG GT Sport Bag/Holdall AMG GT (67 x 35 x 35 cm) exhibits the same colour design - anthracite with Solarbeam accents. The zipper closable bag offers a large main compartment, small inner compartments and several external pockets. Other features include hand carrier straps and a detachable padded shoulder strap. The porcelain AMG GT Cup holds up to ca. 0.3 L of hot beverage. It is also in the anthracite/solar bBeam yellow colour theme with a black printed AMG GT logo. The AMG GT Key Ring at 10.5 cm long, characters a unique mix of stainless steel and carbon leather. It is black and silver and has a pull-twist lock and three additional mini split rings for quick changing and removing of individual keys. A material of choice in the high-end car manufacturing sector, carbon fibre has an exclusive, high-quality and sporty feel. It is perfect for giving elegant Cufflinks a sporty look. The Carbon-Leather design combines the high quality of natural leather material with the fine-rough look of carbon and is a perfect fit to sports cars brand, Mercedes-AMG. A wide range of accessories are available which are handcrafted in Germany and designed in black carbon leather - the AMG Credit Card Holder (10 x 8.3 x 0.5 cm) takes at least six credit cards and offers plenty of rooms for folded bills. The AMG Vehicle Registration Wallet (8.5 x 15 x 0.05 cm) is not only home for registration documents, but also has many compartments for credit cards and bills. Money can be carried in style in the numerous internal compartments of the AMG Mini Wallet (10.5 x 7.5 x 1.5 cm). The black carbon-leather AMG iPhone Case (8.3 x 14.7 x 0.5 cm) is water and dirt repellent. The case is designed for the iPhone 6. The AMG Travel Wallet (13 x 2 x 22.5 cm) made of carbon leather has various internal compartments e.g. for credit cards, airline and train tickets and offers an ideal accompaniment to any business or leisure travel. The sporty and elegant AMG Carbon Key Ring (leather/stainless steel) in black or white complements the key chain with its elegant carbon look. Matching the small leather goods in carbon leather, the elegant Rollerball (metal/leather) always causes an eye-catcher.Packed in a decorative gift box, the AMG Espresso Cups(a set of two) made of white porcelain top off the carbon line. The striking diamond-optic design characteristic of the seats of sports cars is also another recognizable character in the high-quality products of the AMG Selection. New items in the 2015 Selection include Men's AMG Wallet (12 x 9.2 x 1.5 cm) and the AMG Key Wallet (11 x 6.8 x 1.5 cm). Both, handcrafted in Germany, are made of soft black lambskin. The money purse is equipped with several inside pockets and the key holder has six snap hooks for storing individual keys, a pocket for currency bills and an additional zippered compartment. With their charcoal coloured metal frame and grey green lenses, the AMG Sunglasses (100 per cent UV-A/B-400 protection;Optics by Carl Zeiss) provide an elegant addition to every sporty-chic outfit. Sporty chic, paired with high functionality (breathable, windproof, and water repellent) distinguishes the men and women's pair of AMG Women's Performance Jacket. They are made of 100 per cent polyester and are equipped with a removable hood which is also storable in the collar. There is also a cell phone pocket inside the jacket. A two-way zipper aids in underarm ventilation on hot days. The women's jacket (XS-XL) is black with white accents along the zippers. The men's model (S- XXL) is completely black. The printed AMG logo is situated on the chest and inside the collar. Caps are always a hot item and in demand. The AMG Selection 2015 offers three new models - Men's AMG Cap) in black, the Women's AMG Cap in white and the Children's AMG Cap in white/red. The AMG logo embroidery is located on the front of the cap. Other common features include the 100 per cent cotton lining and the metal buckle used to adjust the size.